I slept like a rock and awoke a little reluctantly. Unzipping the window of my tent I looked out over the reeds towards the far shore of the lake. It was cool, cloudy and still. Most of all it was quiet, no buzzing, no voices, nothing but the occasional cricket and click of the reeds quietly tapping into one another. There were enough people around that I knew that couldn’t last and roused enough energy to peel off my sleeping bag and start messing about with stoves, boiling water, tea and breakfast. Once that was done it was time to pack up and head home. Thankfully, at the time I passed through, I was blissfully unaware of any of that and turned west across the high plains with their deep scars towards Condon. The wind out of the north blew steadily across my path and there was simply nothing but wide expanses of golden grass for as far as I could see. 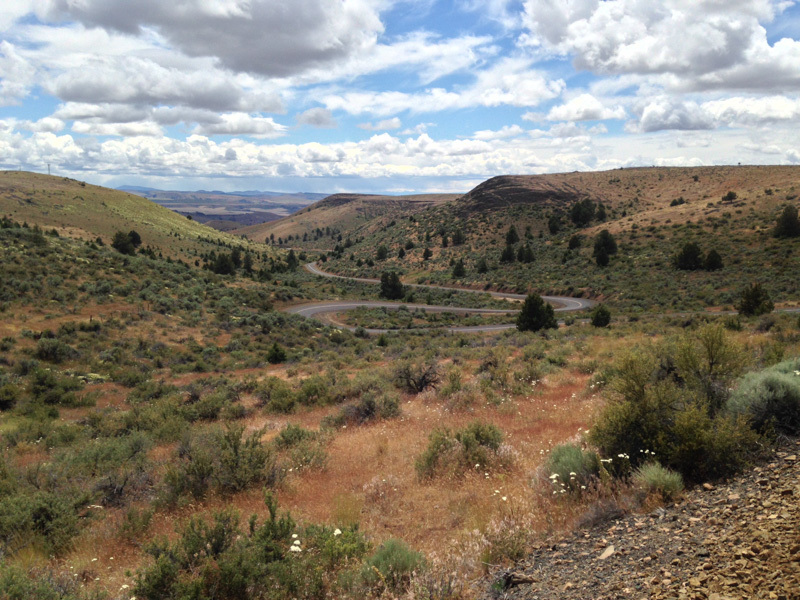 Occasionally, the road would bend and curve happily as it made its way in and then out of ravines, but for the most part the landscape was straight flat and empty. Condon is named, not for Thomas Condon the geologist, but for his lawyer nephew Harvey, who established the place in 1884. Today it seems little changed. 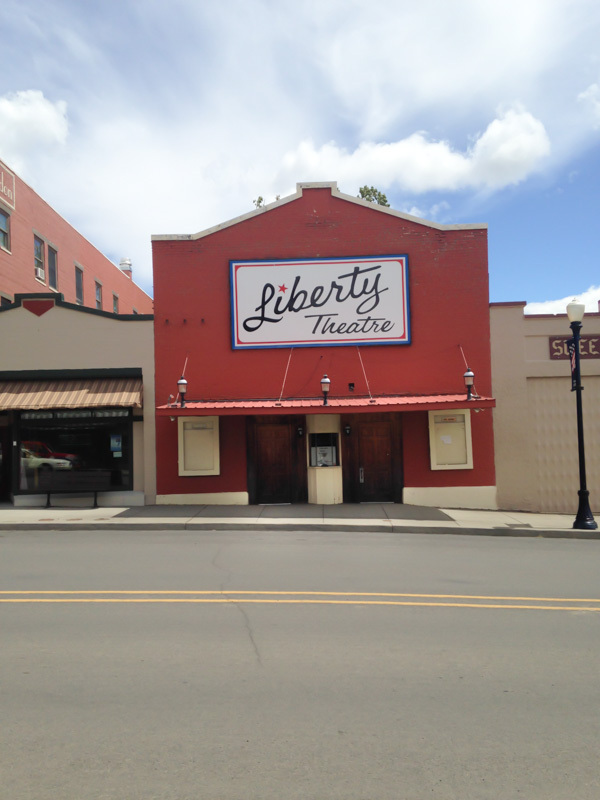 It serves as a center for the county’s agricultural community and boasts an American Graffiti-style main street complete with a retro-looking cinema, the Liberty Theater, and a couple of malt shops. After a quick bite, I carried on south to Fossil, where, of all people, Bill Bowerman, America’s greatest-ever track coach and Nike co-founder, found his final resting place. Fossil has a frontier feel that is only slightly softened by a couple of kitschy antique emporiums and espresso cafés. Heading south along the Shaniko Fossil highway and back into prehistory, it was only a few miles to the Clarno Unit of the John Day Fossil Beds National Monument. The Palisades is a beautifully distinct outcropping formed from the volcanic mudflows that engulfed and ultimately preserved the remains of four-toed horses, meat-eating creodonts and remnants of the surrounding jungles. From there it was on to Antelope, the once and future home of the late Bhagwan Shree Rajneesh and his cult members. In celebration of the 25th anniversary of the collapse of the cult our local rag, The Oregonian, created a nice summary of all the Rajneeshi’s shenanigans a few years ago: Oregonian on Rajneesh. Suffice it to say that even those who believe they have a clear path towards enlightenment may still fall foul of personal ambition and power politics. 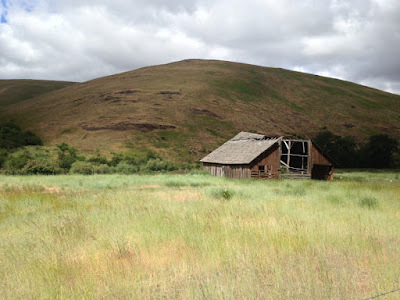 It still impresses me that 2,000 people were so disillusioned with their lives that they pitched it all in and made their way to a dry patch of farmland in the middle of Oregon, presumably hoping the grass would be greener. It wasn’t. Some locals complain that the TV show ‘Portlandia’ is having the same cult-like effect on a new generation - attracting legions of disillusioned wannabe hipsters to the city, filing off its sharper, more creative edges in the process. Mount Hood, like so many of our National Forests, is criss-crossed with any number of logging trails and with a decent compass it’s not that hard to find your way around. Armed as I was with an iPhone I figured that it would be fun to try and find a short cut home. The problem of using an iPhone as a direction finder, however, is that it relies on cellphone signals and batteries which are invariably in short supply deep in the woods. In the end I circumnavigated Timothy Lake and wound up back on Route 26, the main road over the mountain. Then just outside Government Camp the heavens opened. 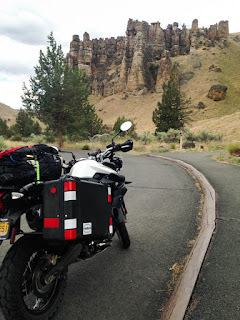 This was my first experience of riding in really, really heavy rain on a motorcycle. I quickly understood why so many riders seek shelter under bridges. It’s not so much a traction issue, which itself can be a learning opportunity, it’s more an problem of visibility. Your helmet fogs, other than your fingers your visor has no wipers, and with spray coming off the road you’re all but invisible to other drivers. Fortunately, the cloudburst didn’t last long and I had more or less dried out by the time I arrived home 40 minutes later. Three days and 300 million years of wild western history on my doorstep. If ever there was an offset to the hustle and bustle of a middle sized city, the empty spaces of Oregon start less than an hour outside Portland. It’s one of the things that makes this part of the world so wonderful to live in. Come, ride, enjoy! *For the complete story of the Heppner flood, pick up a copy of Joann Green Byrd’s excellent account, Calamity: The Heppner Flood of 1903.